As many of you would have figured out by now, I'm from New Zealand ♥. We're a little country in the South Pacific with four-and-a-half million people and 30 million sheep. It's a great place to live; very green, clean and beautiful. 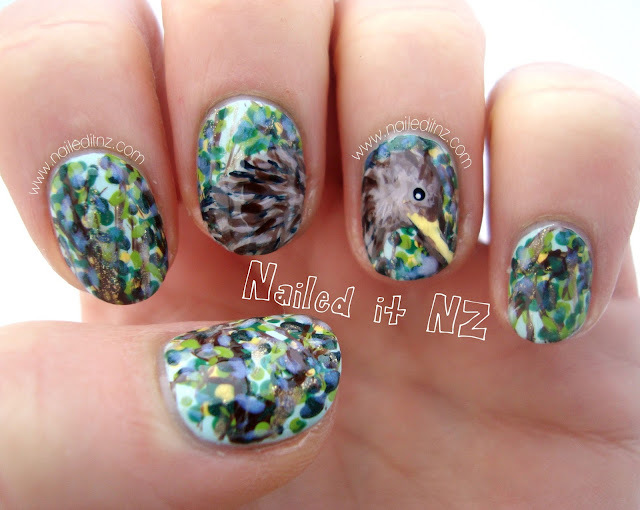 Our national bird is the Kiwi - it's funny looking creature, but still quite cute! You can see a picture of it plus some info here. I was feeling rather patriotic yesterday, so decided to paint a national symbol on my nails. 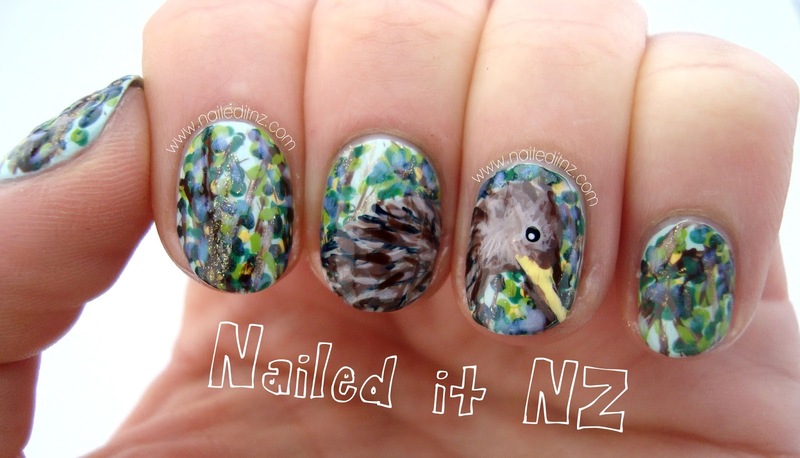 I've done this several times before - marmite, pohutukawas, pukekos, Auckland skyline and the NZ flag. This one time, the marmite nails even got me on TV and in the paper! I did some googling to see what had been done before but there wasn't a lot. I decided that the Kiwi needed to be properly introduced to my nails, so here we are. It's a bit crowded-looking, I admit. 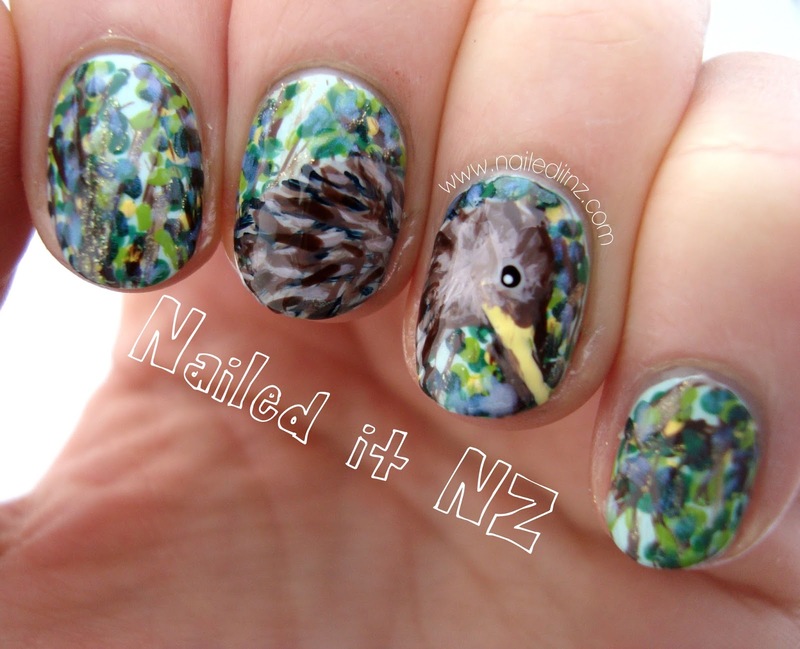 If I do a YouTube tutorial for these I'll probably do a plain black background so the kiwi is more visible. I also mixed a white and brown to get the right colour for around the face. So yeah, a lot of colours. Despite the crowded-ness (yes that is a word) of this design, I still quite like it. 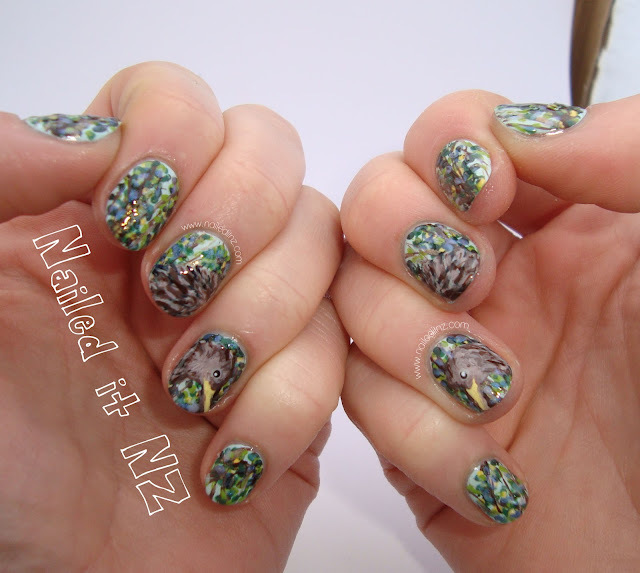 Manicures that mean something are my favourite, and being a New Zealander is definitely something I am proud of. I'm thinking of painting some more NZ symbols on my nails - have a weeks worth of them or something :). I've been eating a whole lot of Weet-bix lately so they might appear at some point!! I just realised that I always leave my personal updates to the end of each post. It's like... I don't want to put them out there too much but I still want to share. Typical. I have this thing (pretty sure it's a disease of some sort) where I meet someone, like them, then pretty much tell them my whole life story, word-vomit style. Anyway, I'm in an exciting and slightly scary stage of life right now. I've left my full time job (still employed with the company on a casual basis though) so I can devote more time to my blog and YouTube. That might sound silly - but bear in mind that my full time job wasn't something I was ever going to pursue a career in, among other things. This means I am extremely poor - there's a reason that I'm only eating Weet-bix right now! Haha, so I've just applied for a job at McDonalds (I worked there for a year after I left high school - loved it) and am really hoping I get to go back to my old store. It was a lot of fun, and very flexible. Next year I'm spending February-August doing a Nail Tech course, and my husband will be studying management. The year after we're thinking of joining Camp America, or something similar! He's never left the country and it's been too long since I've gone anywhere so this is an exciting prospect. 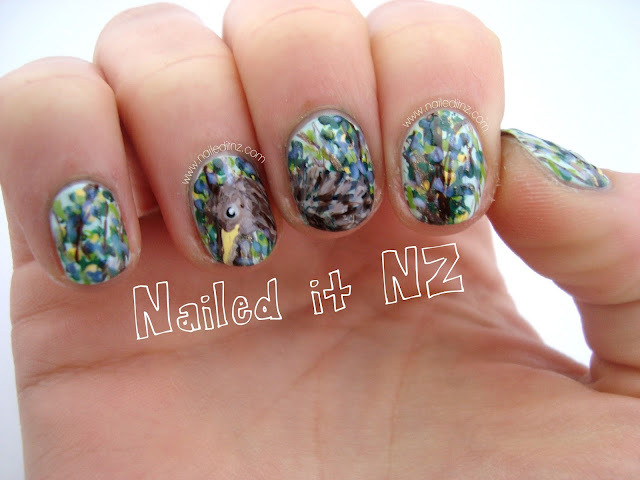 I know that nail art is huge in America too, so I'm really keen to meet some nail artists over there if I get a chance... and who knows, we might end up living there for a while! It's all up in the air and nerve-wracking and exciting all at the same time. I guess we'll just take it one day at a time. Money isn't important to us right now, experience is. Oh man, that really isn't even that coherent. Sigh. Word vomit over. Bloomin' awesome! And to have it identical on both hands, well buggar me I'm impressed! This is amazing!!! You're so talented! Thinking of doing a tutorial with just a plain black background, to simplify it :). Thanks for your advice! Life can be so crazy!